One of the two entrances to the hotel. On my way to India a couple of weeks ago, I decided to schedule a long layover in Beijing. I figured this would give me some time to eat good food (my favorite dumplings) and to see a few sites around the city. The hotel sits one block from the famous Wangfujing Night Market. The hotel has a very tourist friendly location just about a block away from the world famous Wangfujing Night Market. This market is the one that you always see on television where people are eating nasty things like scorpions and larvae. Even if you don’t have a desire to eat such delicacies, a visit to this market is a must! It is a people watcher’s paradise. As for other sites, the Forbidden City & Tienanmen Square are just about a 20 minute walk away. The nearest subway station is only about ten minutes away and from there you can connect to just about anywhere in the city. Beijing is building subway lines at a breakneck pace, but they are struggling to keep up with demand which means crowded trains! With that said, I have always found the Beijing subway to be safe & efficient. It only costs 2 yuan to go anywhere in the city which is like $.35! The Forbidden City’s Eastern Moat. You can reach it in about 15 minutes by foot from the hotel. From the airport you have two options. The first option is to simply take a taxi. Depending on the terminal that you land in, the nearly 30km journey will cost between 70 – 80 yuan or $11-13 USD. If you are feeling adventurous, then you can also take the Airport Express train to the Beijing Subway. The cost of the Airport Express is 25 yuan plus 2 yuan for the subway ticket. The closest station is Dongsi on Line 6 (about a 10 minute walk), although it may be a bit easier to go to Wangfujing station on Line 1 and walk for 15 minutes straight to the hotel since it is located on the same street. 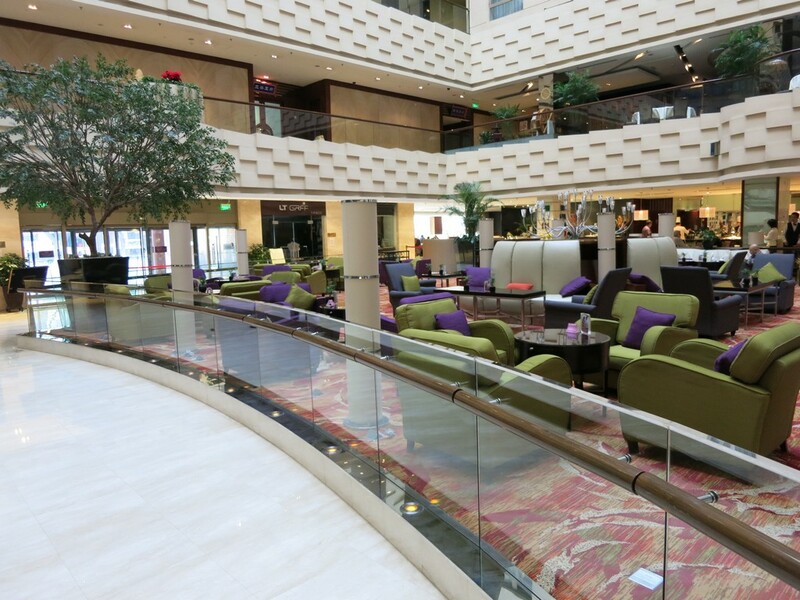 The hotels lobby atrium is spacious and comfortable. This hotel has a beautiful open atrium lobby. The space is both large and comfortable. There are two entrances to the hotel and I noticed that the automatic door on one of them wasn’t working. I almost walked into it two different times since there wasn’t a barricade on the outside to inform anyone that the door wasn’t working. This was the only maintenance issue I noticed though. The Crowne Plaza Wangfujing does have a club level & lounge. Unfortunately the lounge was closed for a refurbishment when I was visiting, but it should be open by now. The space looked to be pretty large, but unfortunately I cannot speak to much else. On the very top level of the hotel is the pool/gym facilities. The pool looked to be large and comfortable, while the gym was fairly average for a hotel of this size. They have an attendant on duty to help guests which I thought was a nice touch. Overall, I was impressed given the age of the hotel. The room was very comfortable and the furnishing were nice. As a Platinum IHG Rewards member I was upgraded to a Deluxe Room. This room while not seemingly different than a normal one, was both attractive and comfortable. My room overlooked the street, but I never heard any noise. In the room when I arrived was both a basket of fruit to welcome me and a coupon for a free drink downstairs. Overall, given the mixed reviews this hotel has received, I was worried, but everything seemed very nice. The bathroom was a little more basic than I am used to seeing in a Crowne Plaza, but it was functional and clean. The welcome gift was a nice touch! I didn’t have a chance to visit any of the restaurants in the hotel, but they didn’t seem to be very busy when I was there. The breakfast buffet is served in the restaurant in the lobby and it looked to have a great selection of both western and Chinese dishes. My only food & beverage experience came when I redeemed my free beverage voucher. I opted to order a Tsing Tao draft beer. The beer came out room temperature which was a bit of a let down. With that said, it is China and they simply don’t have the focus on cold drinks that America has. While I only had limited interactions with the staff, they were quite friendly and helpful. The front desk staff spoke excellent English as did the waiter who brought my beer. The service I received was definitely of a higher quality then what I have experienced in local Chinese hotels in the past. Overall a very nice and comfortable hotel with a great location! The Crowne Plaza Beijing Wangfujing is not the fanciest or nicest Crowne Plaza in the world. Heck, it isn’t even the nicest one in Beijing. With that said, for a tourist, you simply won’t be able to find a better location. Additionally, its proximity to the night market is wonderful and means you don’t have to trounce around the city at night to see it. In the end, the rooms aren’t the newest or shiniest and the bathrooms are a little basic, but I really can’t fault this hotel. The staff at the front desk spoke really good English and answered the few questions that I had. The hotel recognized my elite status both at check-in and with a gift in my room. What more could I ask for?